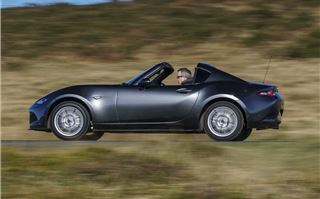 The Mazda MX-5 is renowned as the roadster that’s sold more than any other in the history of the open-top sports car. Yet in the UK, four out of every five of the previous generation model left the showroom as an RC model with its folding hardtop. So, it’s no surprise the Japanese firm has launched a coupe-convertible version of the superb latest version - called the RF. Those initials stand for ‘retractable fastback’ and that’s exactly what the RF is. With the roof up, it’s styled to look like a compact coupe, yet 13 seconds after pressing the switch on the dash you have a fresh air roadster thanks to sections of the roof and rear screen disappearing under the rear deck. 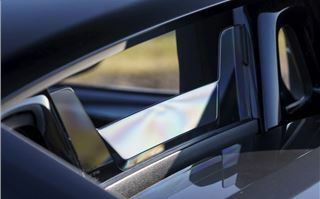 It’s a clever and quick system that can be used at up to 6mph on the move, so you can work it when stuck in traffic and it begins to spot with rain. 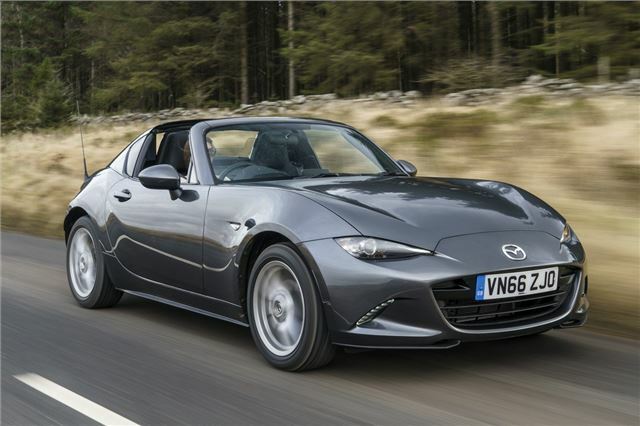 Perhaps more importantly, it adds only 40kg to the overall weight of the MX-5 compared to its roadster brethren. With a car that stakes much of its reputation on driver involvement and enjoyment, that matters a great deal. Thankfully, the weight gain is too slight to notice and the RF is, if anything, a little sharper in its responses when turning into and tracking through a bend. There’s no shimmy from around the windscreen or rear bulkhead and the electrically assisted power steering is among the best you’ll find in any car at any price. 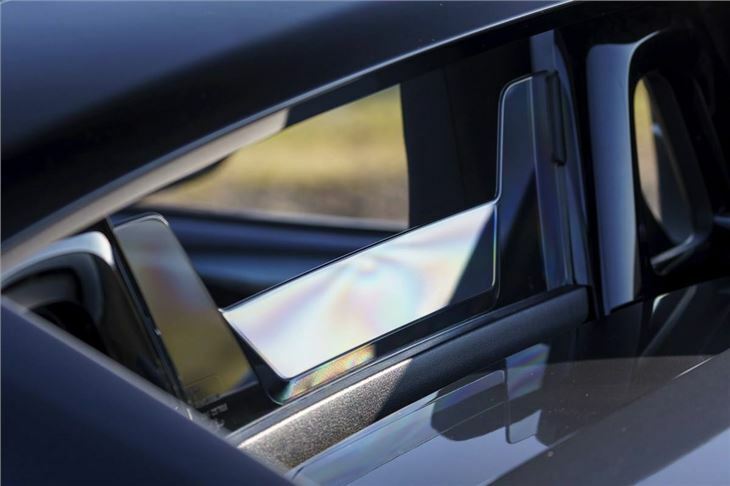 This is where much of that extra weight comes from rather than the retractable roof that’s made of steel, aluminium and composite plastic - plus the glass rear screen. To finish off the attention to detail, Mazda has altered the front air dam to change the aerodynamic balance of the RF compared to the roadster to improve high speed stability. It sounds like a lot of work and the result is an MX-5 that is even more joyous to drive hard when you find a country road open out ahead with no traffic. Like the soft-top model, you don’t need to be going gangbusters fast to have fun. The Mazda appears to be going more quickly when you have the roof down and the wind tugging about your tonsorial style of choice. With the RF’s roof in the lowered position, you can easily drive at motorway speeds without having to shout to converse with your passenger. There’s less buffeting than in the roadster and, with the heater on and heated seats of the Sport Nav model toasting your backside, driving like this in winter is a pleasure. Pop the hard top back into place and the RF’s cabin is quieter than the roadster’s, but not by as many decibels as you might think. There’s still some wind flutter from around the trailing edge of the upper panels and the passenger window in all of the cars we’ve tried suffered a noticeable whistle from where the door glass met the roof seal. A couple of squeaks could also be heard from the roof on rougher roads. Is it enough to put us off the RF? No, so if you want a refined coupe you’d be better off looking at the likes of the Toyota GT86. 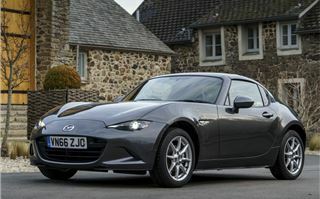 However, the MX-5 RF is better to drive and it shares the same willing engines as the roadster. That means the free-revving 1.5-litre with 131PS and the stronger performing 160PS 2.0-litre that comes with a limited slip differential as standard. Both share a slick six-speed manual gearbox, but acceleration takes an ever-so-slight hit. 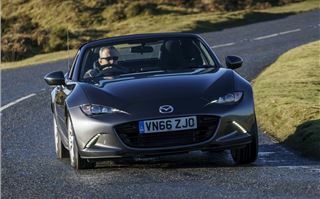 For the 1.5-litre, it’s 0.3 seconds slower from 0-62mph than the roadster and the 2.0-litre RF takes an extra 0.1 second. 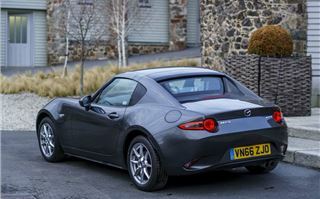 The 1.5 RF is also marginally less economical officially than its soft-top sister. 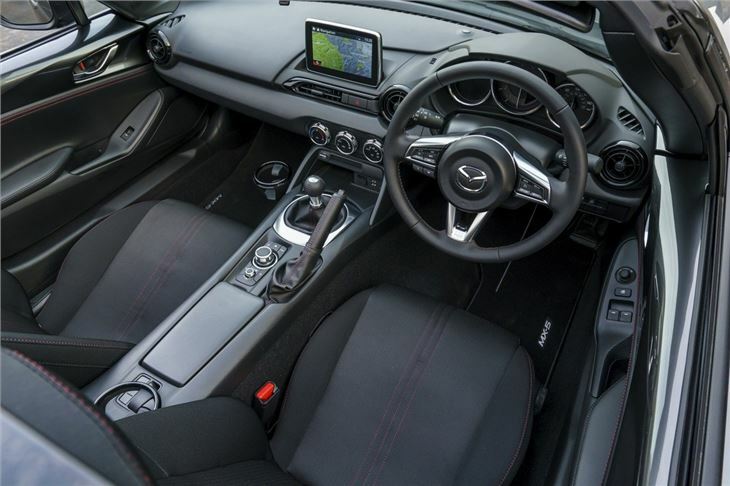 Mazda has also introduced a six ratio automatic to the range coupled to the 2.0-litre engine that deals with 0-62mph in 8.4 seconds and has a claimed 39.2mpg average economy. Otherwise, the RF is much the same as the roadster inside the cabin, with standard equipment and the options you can choose. The only other slight difference is boot space is reduced slightly by 3 litres to 127 litres. 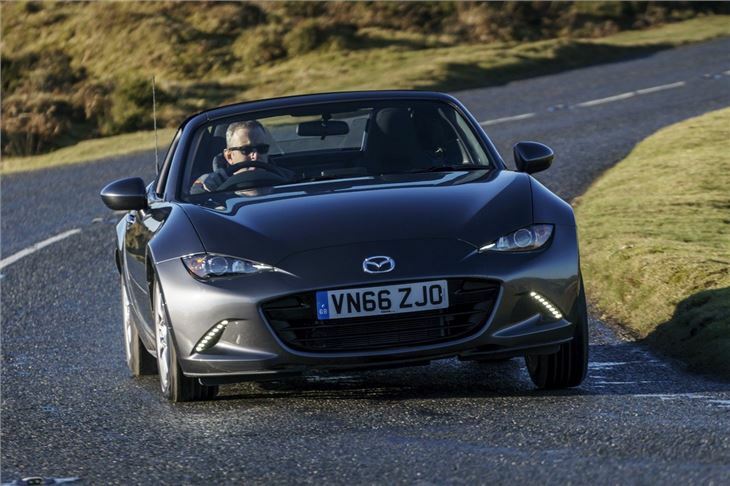 That’s from being a deal-breaker and the RF adds another dimension to the current MX-5 range. 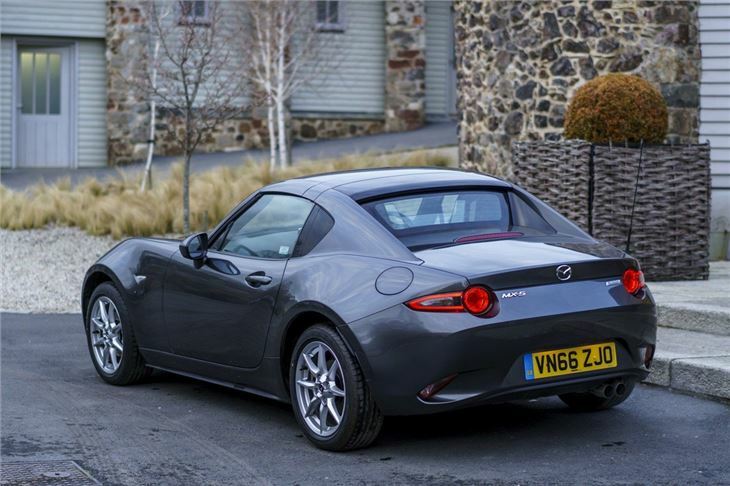 Its looks divide opinion more than the previous RC’s, but there’s no doubt it’s an even more enjoyable car to drive, which is what the MX-5 is all about.